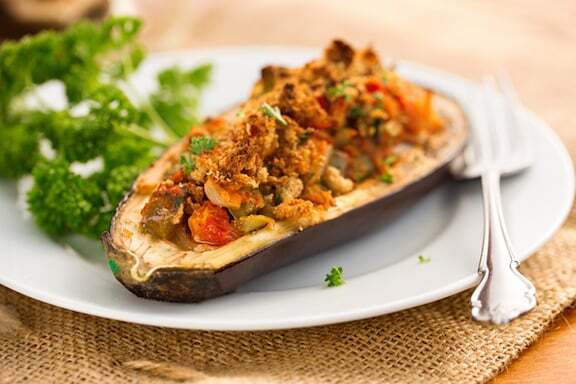 This delicious stuffed eggplant dish is inspired by recipes I came across in old Creole cookbooks. It’s filled with typical Creole flavors like celery, bell pepper, onion and garlic, and seasoned with fresh herbs — parsley, basil, and thyme. It’s a heavenly dish for eggplant fans! Photos by Hannah Kaminsky. 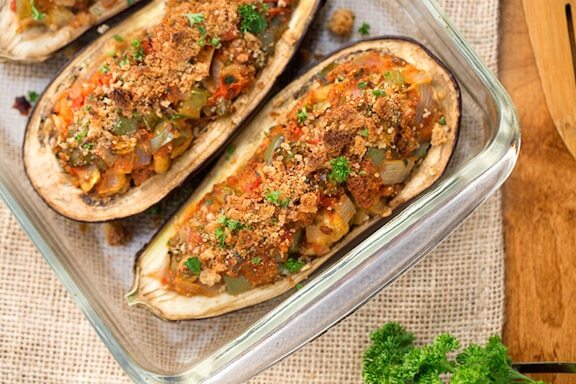 This delicious Creole stuffed eggplant dish is filled with typical Creole flavors like celery, bell pepper, onion and garlic, and seasoned with fresh herbs — parsley, basil, and thyme. Heat the oil in a large skillet. Add the onion, celery, and garlic, and sauté over medium-low heat until the onion is translucent. Add the bell pepper and continue to sauté until the onion is golden. Meanwhile, stem the eggplants and cut them in half lengthwise. With a sharp knife, score each half several times lengthwise and across. Then, carefully remove the pulp, leaving a sturdy ½-inch-thick shell all around. Chop the eggplant pulp and add it to the skillet mixture along with all the remaining ingredients except the bread crumbs. Add a bit of water, just enough to keep the mixture moist. Cook, covered, until the eggplant is tender, stirring occasionally. Stir in half of the bread crumbs. Set the eggplant shells in an oiled shallow baking dish in which they will be securely propped up against one other. Divide the stuffing evenly among the shells. Top evenly with the remaining bread crumbs. Bake for 20 minutes covered, then uncovered for 15 to 20 minutes longer, or until the eggplant shells are tender but not collapsed. Serve at once. 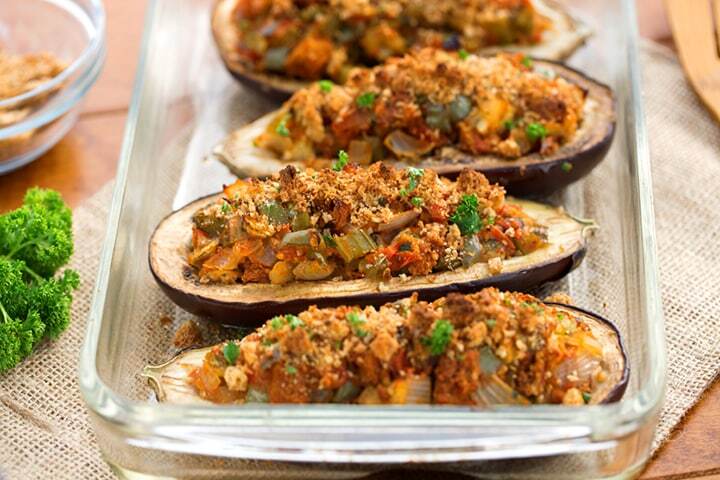 Explore more eggplant recipes on VegKitchen. Here are more Creole classics, veg style. Kristin, one of those large summer zucchinis would work, and it would be a good use for them.